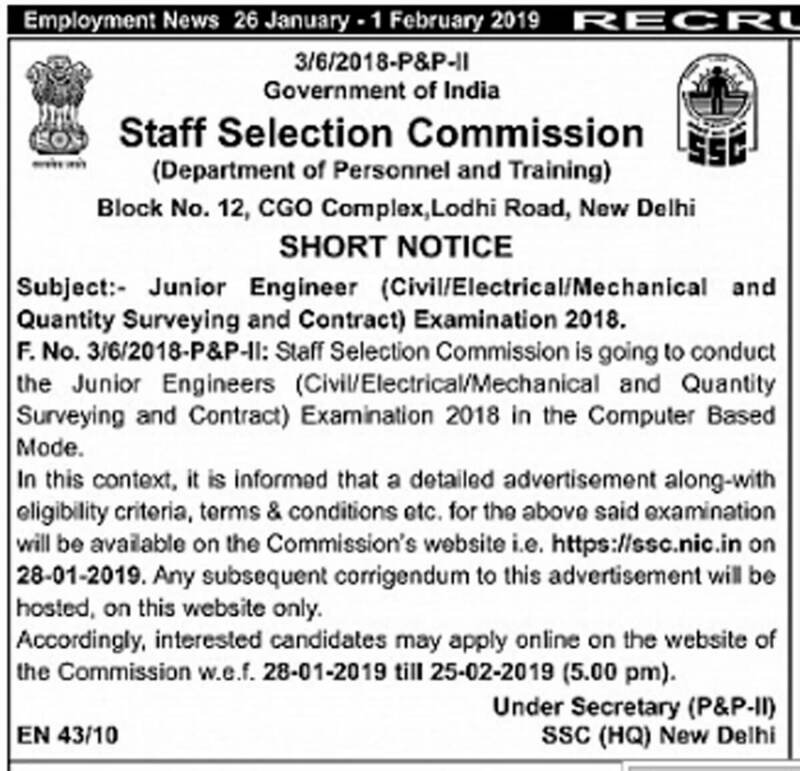 The Staff Selection Commission (SSC) of India has released the short notification for recruitment at the post of Junior Engineer (JE) in the e-employment newspaper. The detailed notification for SSC JE recruitment will be released on the official website soon. As per the short notification, the online registration process was to begin on 28th January 2019. However, another notice has been released by the commission on the official website on 25th January stating that the detailed notification will now be released on 1st February 2019. The Commission has also released the Examination Calendar on 25th January 2019, check it out here. Interested candidates are advised to register before the last date as there might be a heavy load on the official website on the last day of application submission. The commission will not be responsible if the candidates are unable to submit their application forms. SSC will release the detailed information related to eligibility, exam pattern, and other terms and conditions of the exam on the commission’s official website – ssc.nic.in. Till then, candidates can get an idea of the exam pattern and eligibility criteria from the previous year’s notification. Candidates must keep a check on the website for further updates. Can you tell fees for general category?? SSC Junior Engineer 2018-19 Exam Application Process - Apply Now!